The JCPL service area remains one of the most beneficial electricity choice markets for customers as the number of suppliers offering prices below the utility default rate continues to expand. Unfortunately many customers remain ambiguous to the benefits that New Jersey energy choice has created, resulting in only 22% of the residential customers in the JCPL territory taking the time to compare and select an alternative supplier. The low switch numbers remain in tact despite several competitive suppliers offering rates that are more than 10% lower than the JCPL default basic generation service rate. While there are many theories as to why JCPL customers have been slow to shop for competitive energy, the primary reason is centered around the idea that consumers remain undereducated on the benefits and process of energy choice in New Jersey. 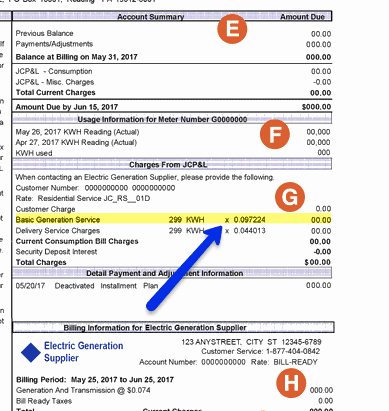 Many consumers are simply confused on how they are supposed to go about comparing competitive electricity rates to the JCPL basic generation service rate, which ultimately determines whether or not they will save money on their bills. If a customer can’t even identify the default rate on the bill, they are unwilling to start comparing electric supplier offers. The competitive rate will completely replace the basic generation service rate, which includes generation and transmission fees. Below the BGS rate is the delivery charge which remains the same no matter which competitive supplier is chosen. The delivery rate is charged directly by JCPL and is regulated by the state. Another factor that has contributed to slow shopping activity in the JCPL residential market is the confusion of where to find the 20 digit Customer Number that the utility requires competitive suppliers to submit when switching over a customer. The Customer Number is the identification that JCPL uses to match the meter and is required to complete an enrollment. Many customers have trouble finding the Customer Number which is written in a small font in the middle of the electric bill. In addition, many shoppers accidentally enter in their 12 digit account number which is more easily found at the top of the electric bill. There are currently around 900,000 residential customers who receive their power from JCPL who are severely overpaying for their electricity supply by paying the basic generation service rate. 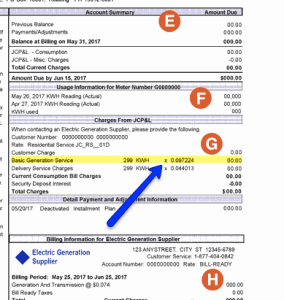 This problem can simply be solved if these customers take the time to learn how to successfully compare New Jersey competitive electricity rates. If the time is taken to do this, the result will be lower JCPL electric bills, pure and simple!